The 2019 Spring Issue of the Journal of Personal Finance (JPF) is now available from the International Association of Registered Financial Consultants (IARFC). The techniques, strategies and research contained in this Academic Journal are intended to support financial literacy whether it be directed to consumers, educators or professional financial consultants. My hope is that we can enhance the exposure of the research we publish, thus meeting our mission to support financial literacy... Dr. Benjamin Cummings, JPF Editor. The publications’ Editorial Board is headed by Dr. Benjamin F. Cummings, CFP®, RFC® who is an Associate Professor of Behavioral Finance at the American College of Financial Services. He has completed award-winning research on the use and value of financial advice and has been quoted in the media, including in MarketWatch and USA Today. His primary responsibilities include teaching behavioral finance in the Financial and Retirement Planning Ph.D. program and advising doctoral candidates on dissertation research. His research focuses on making retirement, charitable, tax and investment decision. Initiated in 2002, the Journal of Personal Finance has grown in scope, acceptance and recognition among practitioners and academicians. The JPF welcomes articles from practicing financial professionals and consultants about financial products and services, client relationships, retirement planning, long-term care, practice management, and firm operational efficiencies. For members of the IARFC, the JPF is a benefit and a source of continuing education credits. Members can take the IARFC Journal of Personal Finance Online CE quizzes. Two hours of IARFC CE will be awarded to members who achieves a score of 70% or higher per quiz. 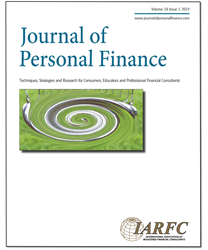 To order a hard copy or electronic version of the Journal of Personal Finance, to find out more information or to review article submission guidelines, go to http://www.journalofpersonalfinance.com or contact the editor. Register to take the CE quiz at the IARFC Store.